La Femme Rouge is a strongly personal piece in which the Martin’s adopt the rhytmics and form language of flamenco and spice it up with their own views and harness the boundlessness of modern music and contemporary art. It is a highly charged requiem where the unpredictability of life can be both crippling and an absurdly empowering force. The Martins are joined on stage by the group’s long-time collaborator, violinist Sanna Salmenkallio, who is known for her compositions of film music. The Sunday night at the Factory Festival Manifesti offered overall a fantastic experience for the full crowd. The atmosphere was indeed so ecstatic, that Compañia Kaari Martin returned the rounds of applause of the excited and enchanted audience with two encores. Flamenco dancer and choreographer Kaari Martin has consistently developed her form of art to new directions. Martin’s contemporary flamenco works are multi-artistic entities where the elements are refined and fall into place perfectly. 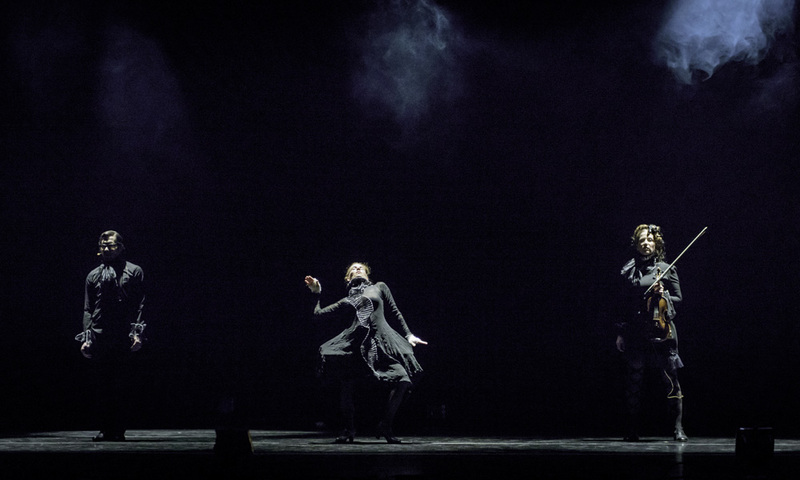 In Manilla, the company performed two pieces, La Femme Rouge and The Raven, which belong to the same trilogy. The avant-garde and partly surrealist approach shows both in the visual appearance and in how the different parts are combined. Erika Turunen’s costume design in different shades of black resembles court gowns, and on the other hand, the 1940s. The stage lighting uses both geometrically defined spot lights and the effect of shadows and darkness. The works are visually intense. The music and lyrics by Roni Martin frame the atmosphere that is filled by different images. In La Femme Rouge, Roni Martin sings, Sanna Salmenkallio plays the violin, and Kaari Martin dances. There is nothing red on stage, but there is plenty of deep emotion that is delicately controlled and restrained. The Raven is Kaari Martin’s internationally awarded solo performance. Martin plays a character who is simultaneously an ominous raven and a stage diva trying to hold back time. The piece is touching with a fine hint of fright. Martin’s dance is stunning. Her body really handles complete pause just as well as rhythmic claps and stretching of arms. She transforms from grotesque to hideous, there is no such things as cute or fragile in Martin’s characters. The Raven claimed all awards possible in the international choreography competition in Madrid last winter. There is no wonder why. Dancer Mariana Collado is as sharp as a knife, solid as a rock, and elastic as a rubber band in her dance. She brings the choreography alive with her eloquence dismissing the solemn face of flamenco. Kaari Martin has boldly used the elements of modern dance in her choreography but has kept the grace, technically challenging footwork and versatile rhythms of flamenco. Some two years ago I thought that movement got buried under the lights, feathers and sound of the production. In this version, movement stood out strongly and quietly carried away the audience. Compañía Kaari Martin’s La Femme Rouge was a new acquaintance. In this piece, flamenco plays an important part in the music, and Roni Martin’s work is magic. I enjoyed the carefully constructed sound world that was rich and oddly harmonious. 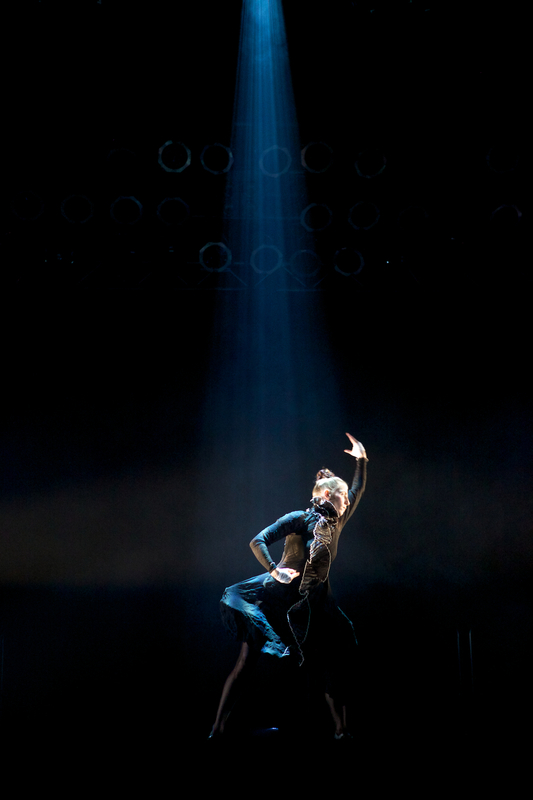 Erika Turunen’s black costumes and Ville Virtanen’s lights made the aesthetics of the production resemble certain Finnish contemporary dance pieces for no reason. The trio awarded for Le Femme Rouge continues their collaboration, also including the group’s favourite violist Sanna Salmenkallio. The performance, that does not have anything red on stage despite the title, at least visually, is dedicated to the memory of Kaari Martin’s father Risto Kautto. This background cannot but affect the experience of the audience. However, the certain solemnity and uncompromising nature of performing make a strong impact, even if one does not know the story behind the performance. The imaginative black costumes designed by Erika Turunen and the soft but sharp spotlights from high above arranged by Ville Virtanen take you to a dark fantasy world. Kaari Martin’s dance is more focused on flamenco than in the previous part of the trilogy and is intensive but highly disciplined. The deep and passionate emotions that are present in Roni Martin’s music and lyrics, as well, are held back. There are sparks every now and then, but they are restrained under a certain dignity. The Friday evening at the Winter Dance Festival ended with the preview of the contemporary flamenco piece La Femme Rouge by Compania Kaari Martin. The work is a part of a trilogy based on Roni Martin’s poems and music, complementing the previous parts Two Dreams in One and The Raven. The trilogy discusses general human themes, like love, loneliness, estrangement and change. Those also represent the dancer’s dialogues with the music and text. The intensive and unique coordination of movement and music, which is a distinctive character of the group, showed instantly in the performance. 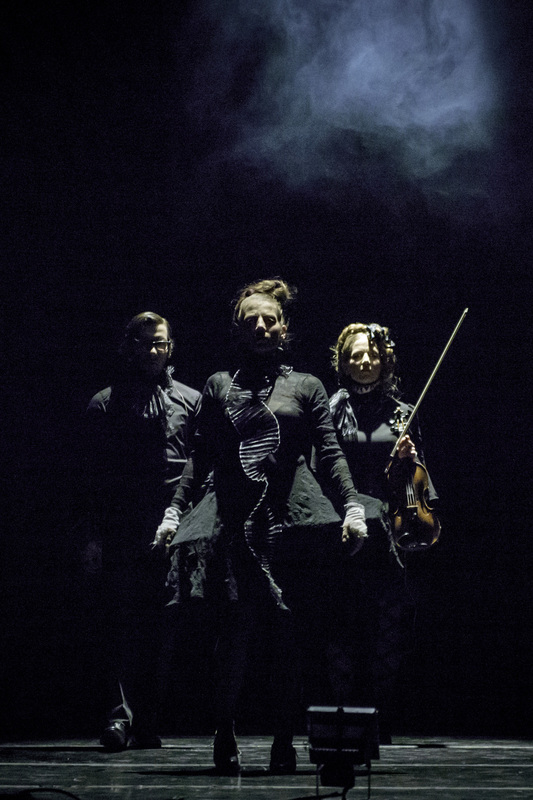 The performers dressed in fascinating black costumes and the plain lighting that focused at one performer at a time tied together all the other elements used in the dramaturgy - live music, sound and text - in a fantastic way. The elements became a one complete entity. The performance did not stay in one place, but the movement, sound and music travelled in ease to surprising and interesting directions and levels. The overall atmosphere was harmonious. Movement on stage was mostly very minimalistic, but effective. The dynamic and classy performance was in constant motion. The performance ended in the dark as secretly as it first began. One would have loved to see more.